Attention Texas providers: We’re pleased to announce that SimpleCFS™ users will be able to manage portions of the new Texas PASRR Nursing Facility Specialized Services (NFSS) form right inside the software. Watch this informative customer webinar to learn the details. 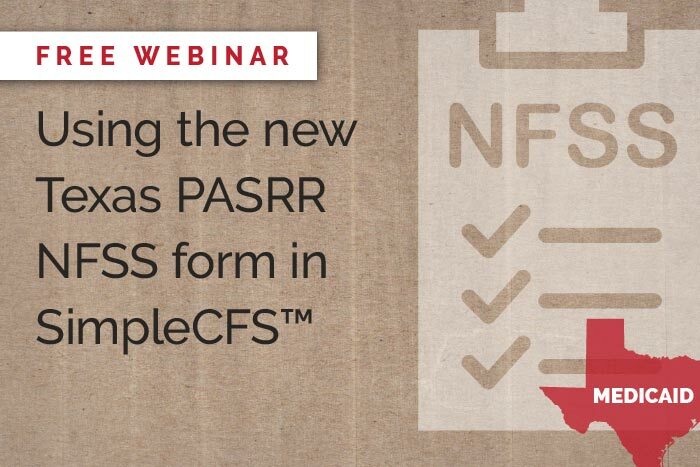 The new NFSS form allows Texas NFs to enter requests for specialized services for authorization by Health and Human Services (HHSC) Intellectual and Developmental Disabilities (IDD) PASRR Unit. TMHP has announced that paper versions of the NFSS form will no longer be accepted as of Friday, June 23, 2017. What is the NFSS form? Hi Mary — Please take a look at our PASRR Resources page. We regularly update it with new information. Also, be sure to sign up for the October and December PASRR training webinars from Texas HHSC. If our facility does not have Simple, where are the instructions for entering the CMWC request into TMHP? Hi Joan — You will need to contact TMHP for assistance at 800-626-4117.